Were Adam and Eve humanity's first parents? Genetics show that our beginning comes from a population much larger than one couple. Can belief in evolution and Christianity mix? "Evolution can be a scary word for some of us within the evangelical community," says Venema. "I hope that this series of lectures helps students become better informed about the science behind evolution, and better equipped to meaningfully integrate their faith with what modern biology is telling us." 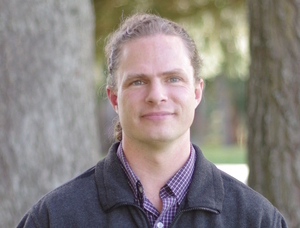 "Dr. Dennis Venema is an accomplished and gifted researcher and writer who is facing, head on, critical issues in both biology and theology," says Justin Neufeld, Instructor of Philosophy at CMU and this year's convenor of the Scientist in Residence events. A student forum titled, "Adam, Eve, and Evolution: Navigating the Issues," on Monday, February 4 from 11:30 AM to 12:00 PM in the CMU Chapel (600 Shaftesbury Blvd.). A chapel titled, "Loving God with our Hearts, Souls, and Minds," on Tuesday, February 5 from 11:30 AM to 12:00 PM in the CMU Chapel. A lecture titled, "Fearfully and Wonderfully Made? 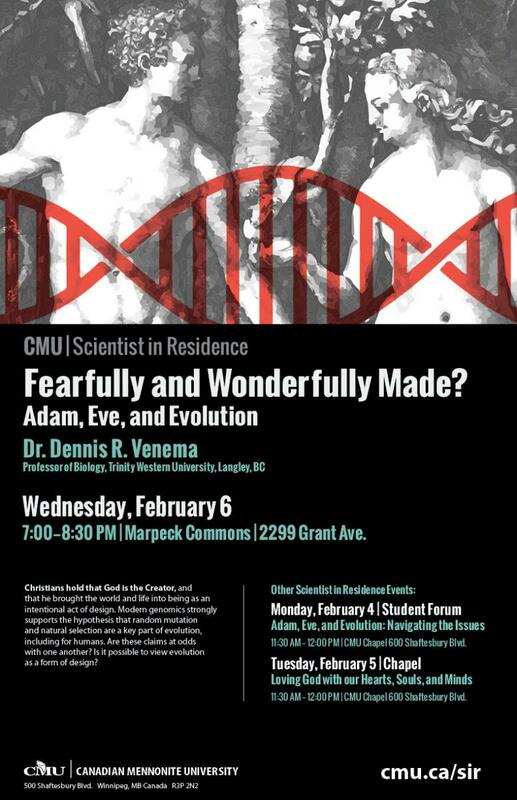 Adam, Eve, and Evolution," on Wednesday, February 6 at 7:00 PM in Marpeck Commons (2299 Grant Ave.). This lecture will be streamed live online at cmu.ca/sir. "I'm thrilled to be invited to be the Scientist in Residence at CMU for 2019. I think it's a wonderful opportunity for students, and I am honoured to join a prestigious group of prior participants," he says. "I hope that these conversations can help students along the path to embracing both God's word and God's world as a source of reliable revelation to us."